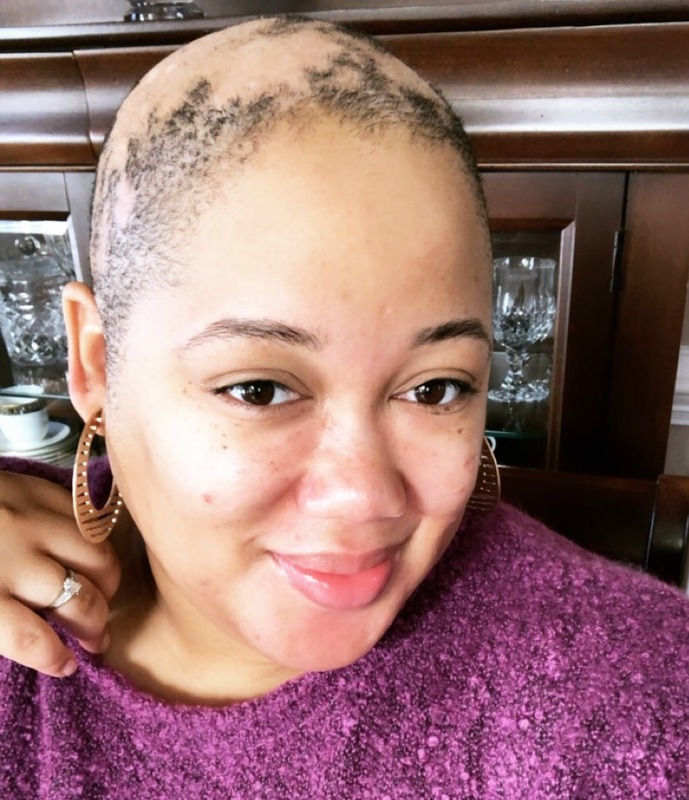 In December, I was diagnosed with Androgenetic Alopecia. Ever since mid-October, I knew something was going on with my hair, but I was sure the shedding and thinning could be remedied rather quickly. So, imagine my surprise when my hair stylist looked at my scalp and said, “This looks like Alopecia. I want you to go to a dermatologist ASAP to find out for sure.” Immediately, I went to trusty Google to look up Alopecia. I’d heard of the condition before but wasn’t fully knowledgable about the causes, symptoms, or treatments. The images and the amount of information were extremely overwhelming. But, isn’t that always the case when you look up your symptoms or a possible diagnoses on Google? Fast forward a week later, I’m at the dermatologists’ office, anxiously waiting to be seen. After a thorough consultation, she confirmed that I indeed had Alopecia areata, but wanted to do a biopsy and send me for blood work to figure out the cause. I’ve never had a biopsy of any kind, and I hate going for bloodwork. However, I too was eager to figure out the root cause. So, I reluctantly scheduled both appointments just a few weeks before Christmas. 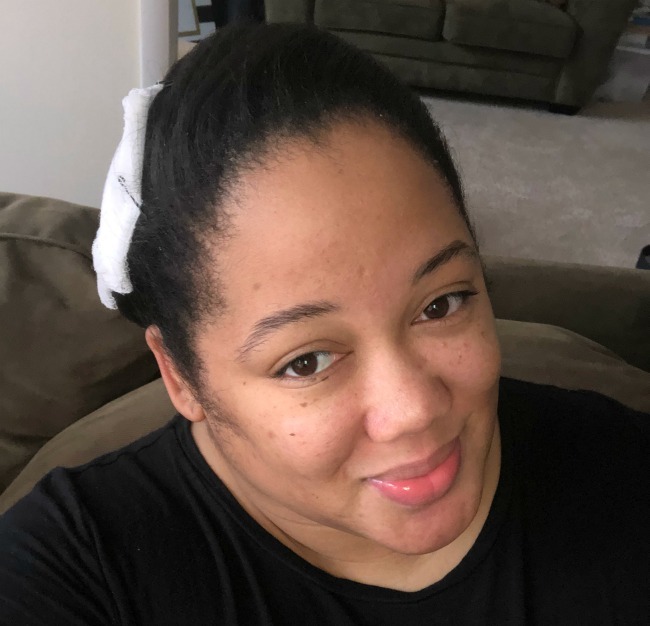 Two days after Christmas, I returned to my dermatologists’ office for my results – Androgenetic Alopecia. In laymen’s terms, female pattern hair loss, and in my case it’s hereditary. We discussed my treatment options, I decided how I wanted to proceed, and I started treatment the very next day. 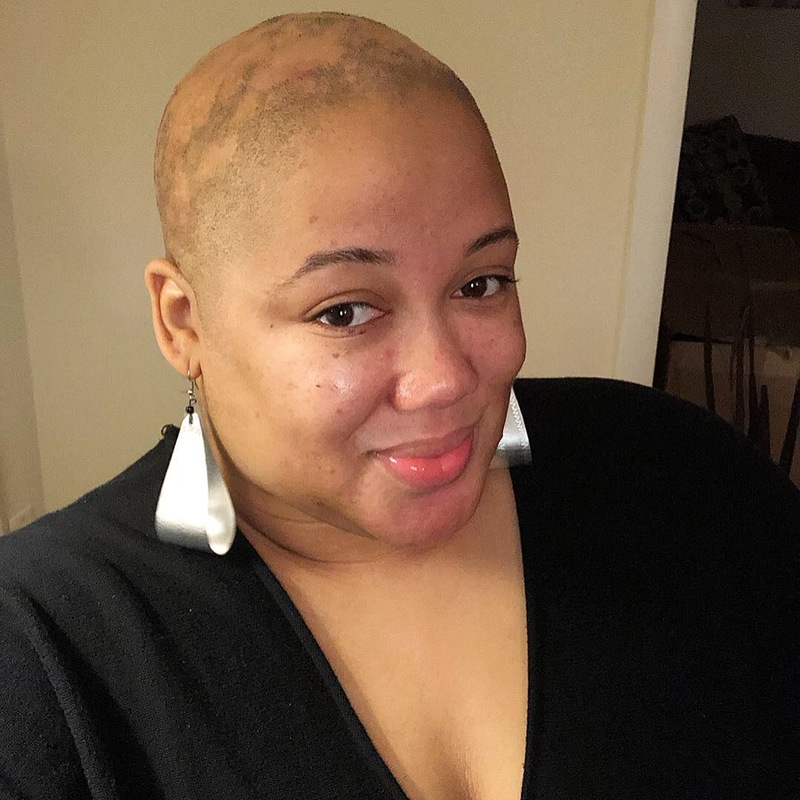 After receiving my diagnoses, I was extremely thankful that my Alopecia was not connected to any autoimmune or any other disease. Knowing that I still had hair follicles was also a relief. However, I was still unhappy with the current state of my hair. It was brittle, dry, and I was combing out clumps the size of quarters morning and night. Even when I combed my hair as gentle as possible, I could literally hear my hair breaking off. I also felt the bald spots throughout my scalp. I hated it. It was depressing and emotionally draining. I mentioned cutting my hair to my dermatologist early on, and she told me it wouldn’t hurt or help my condition. It would, however, allow her to clearly see my hair pattern. I also shared how depressing it was for me to comb my hair, and she did agree that cutting it may help emotionally. I brought up the idea (again) to Darrius and he was all for it. Although it was ultimately my decision, and something we’d discussed weeks before, I wanted to make him aware that I was actually going through with it. So, on Monday, January 14th, with my husband and younger sister by my side, I arrived at my appointment to see Susan, a Senior Cosmetologist, and Certified Hair Loss Specialist, to cut off my hair…all of it. This is my new normal. It’s taking time for me to adjust, but I can honestly say I’ve never felt freer. As I shared on Instagram, I know this journey will have its ups and downs. I just thank God for blessing me with an incredibly supportive, loving and encouraging village – my husband, family, and close friends. I’m also extremely thankful for my attentive and knowledgeable A-Team (Alopecia Team) – Dr. Kindred (Board-Certified Dermatologistgist), Susan Peterkin (Senior Cosmetologist, Certified Hair Loss Specialist & Natural Hair Educator), and the entire Kindred Hair & Skin Center. I’m also grateful to my hairstylist, Tamara. She took my hair concerns seriously and encouraged me to see a dermatologist in the first place. This diagnosis has given me a new perspective on my purpose, and I plan to educate myself first, then others. That said, I will be sharing my journey, and keeping you informed as much as possible. I hope this post answered some of the questions I received on social media, as well as questions you may have had while reading. I will answer more detailed questions in the near future. To everyone on social media who have sent encouraging messages, scriptures, prayers, etc. THANK YOU once again. As I said last week, I am truly humbled by the love I’ve received from my social media community. Until next time, be blessed, stay safe, and take care of yourself. Talk soon!